Why worry about Extinction? Choose the right forecasting method! For instance, to forecast data by Time, Time Series Analysis can be used; and to forecast data from different places, Cross Sectional Data Analysis will be helpful. In order to simplify the theory, let’s use an example of wildlife. Wild animals are perishing due to many natural and artificial reasons from planet earth which is a huge matter of concern. Example 1: To find out the increase ‘or’ decrease of the Lion population for a specific region in last five years. Time Series Analysis will prove to be the best for forecasting. Example 2: To study the population of Lions in different regions during the same time frame, we will to use Cross Sectional Analysis. Example 3: The major problem arises when one tries to study the population of Lions in the past 5 years for different regions. In this instance, pooling the required data is necessary viz. Panel Data. 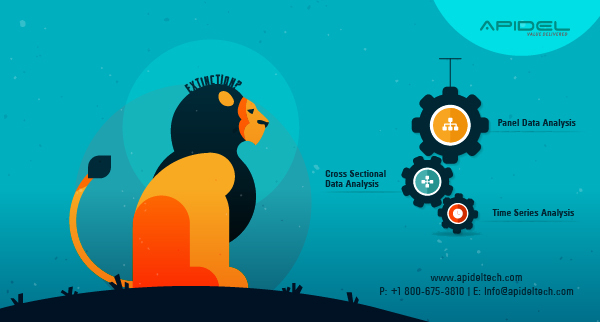 Simply put: Panel Data Analysis is a combination of Cross Sectional & Time Series Analysis. In order to analyse similar data, we need to make use of specific tools. Here, I am sharing some specific codes and commands of R-studio. 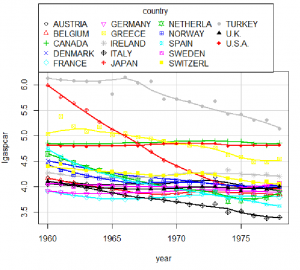 Example: I have inbuilt data for Gasoline consumed by various countries in previous years. First step is data extraction, once data is extracted; programming can be done to derive the Fixed Effect & Random Effect Models. # Breusch-Pagan Lagrange Multiplier for Random Effects. Null is no Panel Effect (i.e. OLS is better). Data Science will remain the sexiest job of the 21st century despite the problems scientists face with preparation of data. However, it’s best for a user to decide which forecasting method will suit their problem. C. Income on child health, etc.